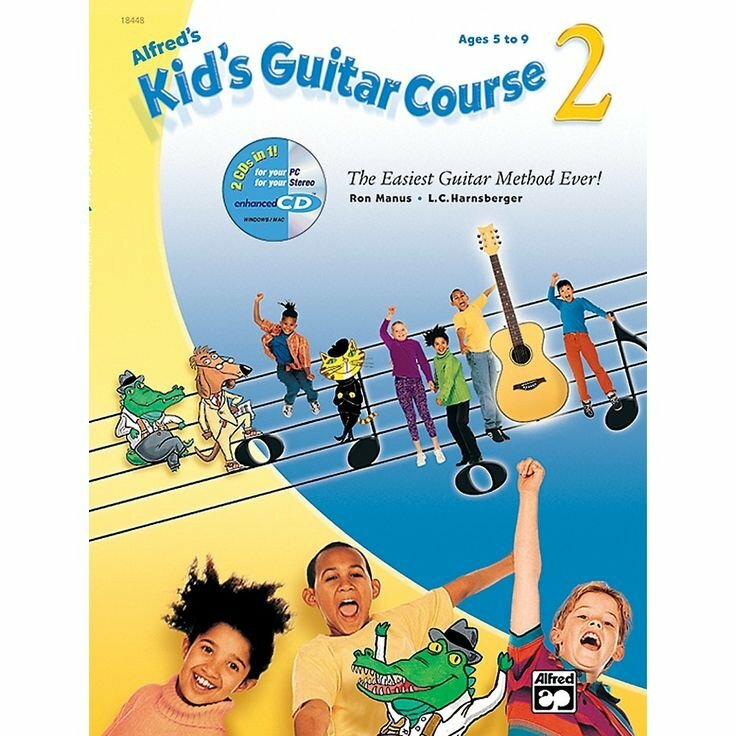 Alfred's Kid's Guitar Course is the #1 best-selling guitar method for kids! This award-winning ("Best Product of the Year" -- Disney's iParenting Media Award) method is the easiest guitar method ever for kids ages 5 and up. Using plain language that’s easy for kids to understand, three irresistible guitar experts guide students along---a clever classical dog, one cool jazz cat, and a friendly alligator who loves the blues---they draw attention to what's important on each page and make learning music fun! Kids will learn to play chords and melodies, read music, and perform lots of fun songs. In Level 2, you will learn more notes, songs, chords, and notation---all in clear and simple lessons. By the time you finish, you will understand dynamics, accompaniment patterns, and new rhythms, and play on all six strings! The book comes to life on your stereo and your computer with the enclosed enhanced-CD. The disc includes beautiful recordings of all the music in the book and can be played on your CD player or downloaded to your iPod® or other mp3 player. Play the same disc on your computer (Windows/Mac compatible) to instantly access an interactive guitar tuner, digital guitar chord dictionary, and play-along songs! Kids can see and hear the music, and even adjust the tempo of songs for practice or performance!